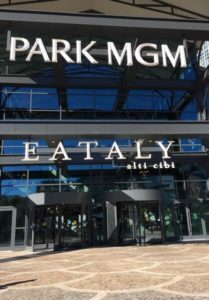 Italians are known for their exceptional hospitality and their love of cooking; and Italian food is the world’s greatest cuisine, so it was no surprise that Eataly has been a hit since its debut on December 27, 2018, when it opened its sixth U.S. location at Park MGM (formerly known as the Monte Carlo Hotel) on The Strip and became part of Las Vegas’ emerging culinary scene. 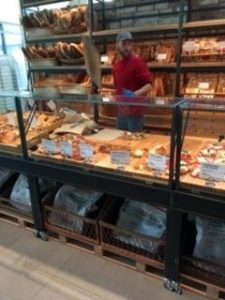 You will feel like a “kid in a candy shop” when you walk through the doors of Eataly. 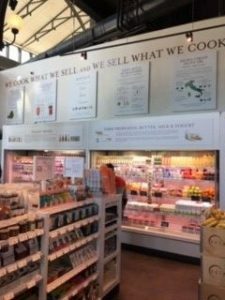 This mega-marketplace, with a design based on old European marketplaces, serves breakfast, lunch, dinner and late-night bites, and includes grab-and-go counters, cafés and retail with 5,000 products for purchase, 2000 of which are a first in Las Vegas, and two restaurants, all under one roof. While Eataly is basically an elevated food court, there is nothing basic about it. 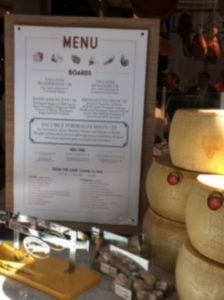 Eataly is a gastronomic exploration into both the culture and cuisine of Italy where you can create your own experience. Your expectations will continue to be exceeded as you take a journey around Eataly Las Vegas. Space is so enormous there are maps at the entrances, so you can better navigate through the 40,000 square feet of space as you make the rounds to the different eateries. 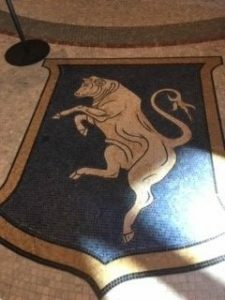 Every Eataly location develops their own identity, but there are a lot of firsts and unique features at the Vegas property that no other Eataly has; one of which is a dancing bull mosaic etched into the floor at the main entrance; a replica of the “good luck” bull inside the Galleria Vittorio Emanuele II, Italy’s oldest shopping mall. 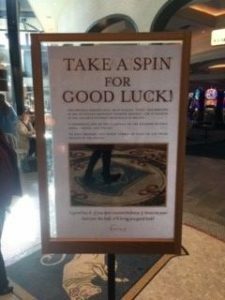 It is said that if you put your foot on the bull and turn 360-degrees clockwise, three times, the legend is that it will bring good luck, perfect for a gambling town like Las Vegas. 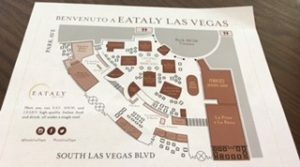 No other Eataly location is near a casino, another Las Vegas first. 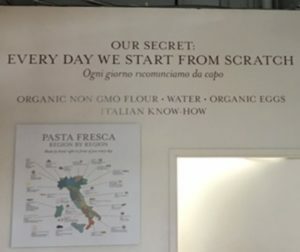 Eataly introduced a brand-new concept at the Strip location called Cucina del Mercato (Kitchen of the Market), with 6 different fresh counter-to-table experiences where guests can “eat what they shop, and shop what they eat”, in other words, visitors can order something to eat at Eataly or take it to go. La Macelleria (Butcher & Kitchen where you select a meat and have it cooked on the spot or bring it home), La Pescheria (The Fishmonger, a selection of small plates, grilled fish and fresh seafood), La Pasta Fresca Market & Kitchen (where guests can watch fresh pasta being made), La Salumeria (Cheesemonger & Kitchen, showcasing more than 100 types of cured meats and 200 varieties of cheese sourced from Italy and the U.S.), La Pizzeria (handcrafted Roman pizza, a nod to Rome’s favorite street food) and Italian Street Food: Il Fritto, La Rosticceria, and Mozzarella Bar (this counter is divided into 3 sections serving traditional Italian street food specialties. 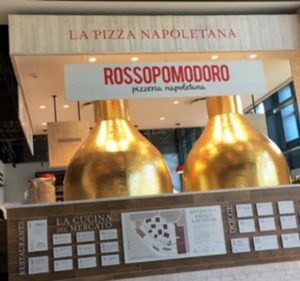 Il Fritto, bites like Arancini and fried seafood; La Rosticceria, rotisserie chickens, seasonal vegetables and panini; and the Mozzarella Bar, a variety of house-made Mozzarella. For those guests who prefer a seated and served dining experience, Eataly has two restaurants, Manzo, meaning “beef” in Italian, set to open in February. Manzo is an 80-seat fine-dining butcher’s restaurant that will serve traditional dishes, dry-aged meats, fresh pasta specialties, and an elevated wine menu. La Pizza e La Pasta, specializing in Napoli-style pizza, by the pie or by the slice, and a variety of pasta dishes. There is no shortage of libations at Eataly Las Vegas. 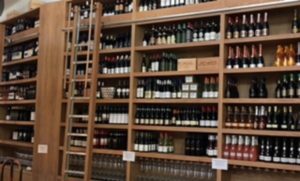 The wine shop boasts one of the largest and most diverse selections of premium Italian wines, beer, and liquor in Las Vegas. There are over 1,000 wines from all 20 regions in Italy, a wine department that carries more than 400 Italian wine labels and 3 bars that offer handcrafted Italian specialty cocktails and spirits, a selection of beers, wines by the bottle, by the glass and wine on tap. L’Enoteca: Eataly’s premier bar with more than 80 Italian regional wines by the bottle, Gran Caffè Milano, an upscale, full-service Italian bar, with a design inspiration taken from the elegant cafés in Milano, will stay open 24/7 and serve breakfast, lunch and dinner; L’Aperitivo is located at the main entrance and suggests that it be your first stop, dedicated to the theory that if you drink something before you eat, it will stimulate your appetite. Here you will find the Negronis and the ever-popular Aperol Spritz made with Aperol, Prosecco and soda water. 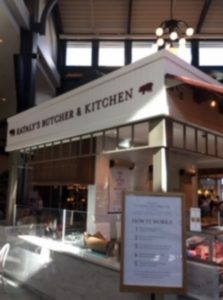 It’s all about fresh, high-quality ingredients and traditional, authentic Italian food at Eataly and some of the foods offered in the Vegas location are available for the first time in the U.S.
A rare sighting in Las Vegas is a clock. 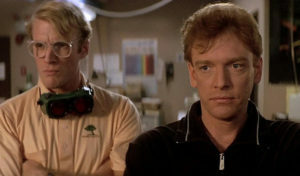 The theory is that if you don’t know the time, you will stay in the casino longer and the longer you stay in the casino, the more chance you have at winning. But Eataly has an extremely large clock hanging from the ceiling that you will only see in Vegas, and it can be seen from every vantage point inside the venue. It lets guests know that food is served around the clock and it’s always time to eat at Eataly Las Vegas. Eataly is an immersive, interactive experience that engages customers featuring cooking classes, complimentary wine tastings, pizza and pasta-making demonstrations, and an interactive Chef’s Table that can be booked for private groups up to 12 people. 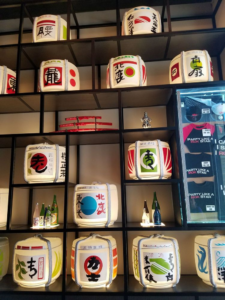 To attract customers and maintain a competitive edge in the foodservice industry, the venue has to be in the right location, serve good food and provide unparalleled service. 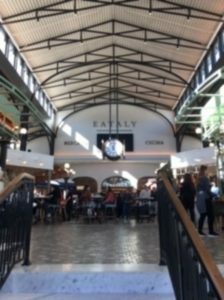 Eataly Las Vegas embodies all of that, it’s the perfect destination, located in the heart of the famous Las Vegas Strip, the food and drink are beyond good and the service is outstanding! Make sure you are hungry and thirsty when you stop by, so you can take full advantage of everything they have to offer. 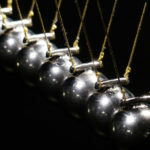 Previous Post Keep up the Momentum!